The Mouflon are a true wild sheep species (you realize it when you try to hunt them). They are characterized by heart shaped horns, a short tail, and a white saddle patch toward the rear of their back. 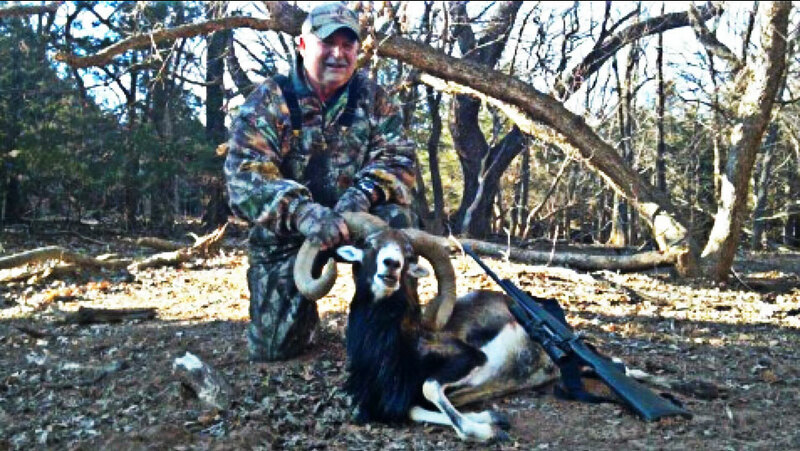 Our Mouflon Hunts take place on some of the most beautiful terrain in Oklahoma. Our Mouflon Hunts are typically a spot and stalk hunt with one of our professional guides. The guiding and transportation is included with this hunt as well. If you have any physical limitations we will try our best to accommodate you as well and many times we can harvest one by a combination of stand hunting or by transporting you by UTV to get you on a short stalk. These beautiful rams make a magnificent addition to your trophy room and memories that will last a lifetime. We can conduct this hunt with single hunters or with groups of 10 or more.